UNSW Eastern Suburbs vs. East Coast Eagles – Henson Park on Saturday, August 11, 2018. The finals are nearly upon us. Only one more week of the regular season remains. But so tight is the battle for finals positions that only two teams are guaranteed a finals appearance, while four teams are battling it out for the remaining three spots. A team with more wins than losses will miss out. The pivotal game in round 17 was at Henson Park, where UNSW Eastern Suburbs hosted the East Coast Eagles. For the winner, the double-chance in the finals would be assured. The loser would risk dropping back into the peloton of chasing teams and even making the finals would be far from guaranteed. 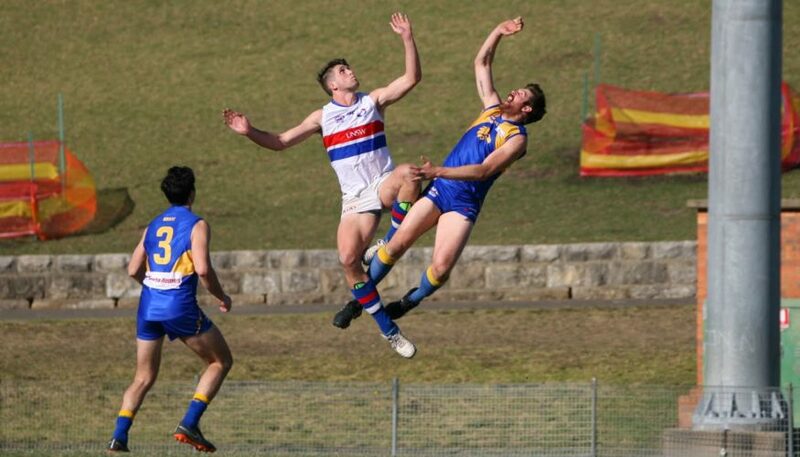 The stakes were high, but it was the UNSW Eastern Suburbs Bulldogs who looked better prepared. Bursting out of the blocks, it didn’t take long for the scoreboard to be ticking over, as the Bulldogs assumed control of the contest and made what would be a match-winning break in the opening term. Five goals to one was the story on the scoreboard, a reflection of the lopsided nature of play in a term where the Bulldogs raced to a 28 point lead and condemned the Eagles to a game of playing risky catch-up footy. The East Coast Eagles had the wind in the second quarter, but were unable to make up enough ground to recover their chances in the contest. Their defence held up well, and UNSW Eastern Suburbs did not add to their score in the second term. But up forward East Coast struggled to create chances, well held back by the Bulldog defenders who rallied around the ball in numbers and not enough leads were able to be generated. The East Coast Eagles were held to two goals for the quarter, with UNSW Eastern Suburbs still 11 points to the good at the long break. With the double-chance on the line, the Bulldogs rose to the occasion in the third term, and East Coast were unable to match it with them. A team with premiership aspirations lifted in the premiership quarter with a term of footy that underlined their credentials, well drilled and executing the game plan magnificently. The quarter would yield five goals to one, and with a 39 point lead at the last change, the game was safely won. The Eagles salvaged some percentage in the last term, while the Bulldogs were happy to put their cue in the rack with the satisfaction of a job well done and finals guaranteed. East Coast added four goals to one in the final term, but it was the Bulldogs with the 20-point win, and plenty of volume and passion in the rooms as the song was sung. Darren Pfeiffer, Luke Essenstam and Jack Blair were standouts for the Bulldogs, and they were three of many who played their roles in a strong performance. They made the top three last year and crashed out of the finals in straight sets, but they look better prepared for finals this year and could make a bigger impact. East Coast were well served by the efforts of Aaron Drinkwater, Jamie Vlatko and Andrew Browning. But it wasn’t enough to get the win. Their finals hopes are going to go down to the wire. East Coast are still a game clear in third spot. But in the last round, they play minor premiers North Shore. Sydney University, Manly Warringah and Pennant Hills are a game behind, with Sydney University and Manly Warringah having a better percentage than the Eagles and the Demons not far behind. If the East Coast Eagles win, they stay third and have the double-chance in the finals. The Students play Camden, while the Wolves play UTS, games they would be expected to win. If the Eagles go down to North Shore, they would likely be passed by Sydney University and Manly Warringah and fall out of the double-chance in the finals. And if Pennant Hills can knock off UNSW Eastern Suburbs with the aggregate of the Eagles’ losing margin and the Demon’s winning margin being more than about 20 points, the Eagles would miss the finals completely. But if UNSW Eastern Suburbs defeat Pennant Hills, East Coast will survive into the finals and the reigning premiers will miss out. It’s going to be a nervous final day of the season. UNSW EASTERN SUBURBS GOALS – T Dickson 3, S Pollock 2, T Banuelos 2, T Redden, D Pfeiffer, M Rawlinson, J Pascoe. EAST COAST GOALS – Jamie Vlatko 3, D Visser, R Haupt, A Drinkwater, M Weekes, T Stubbs. UNSW EASTERN SUBURBS BEST – D Pfeiffer, L Essenstam, J Blair, M Thompson, J McKinlay, T Dickson. EAST COAST BEST – A Drinkwater, Jamie Vlatko, A Browning, B Clark, K Merson, R Haupt.